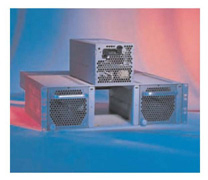 Switching power supplies and Pioneer Magnetics, Inc. are synonymous with switchmode technology. During the last 50 years, Pioneer Magnetics, Inc. has continued to set the standard for switching power supplies. 5" X 8" X 11". Following this still produced product line are "cutting edge" 3U, 2U and 1U switching technology power supplies ranging in power from 500 watts to 10 kW's. Pioneer Magnetics, Inc. AC-DC and DC-DC global leadership is primarily low voltage - high current. 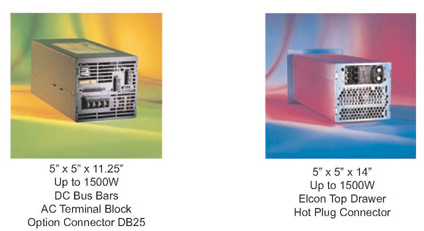 Our switching power supplies are both fan motor cooled or liquid cooled. If more power and more cooling are required, once again, Pioneer Magnetics, Inc. maintains its technological leadership with its high-powered liquid cooled family of switching power supplies. 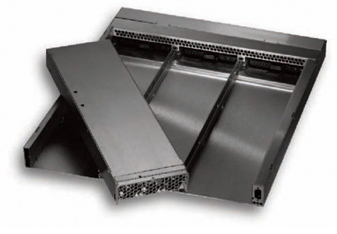 These switching power supplies range from less than 25 kW's to 35 kW's in a 2U X 19" rack-mounted configuration. Key to the switching power supply technology is power factor correction, which was designed by Pioneer Magnetics, Inc. along with a myriad of other options and configurations. For years, Pioneer Magnetics, Inc. has been meeting the technological requirements for the switching power supply market. In addition, Pioneer Magnetics, Inc. has been offering many value added configurations such as racks or power shelves, sub-cabinets and other electro-mechanical devices that most other power supply companies will not offer. Switching power supply technology and Pioneer Magnetics, Inc. go hand-in-hand. Pioneer Magnetics, Inc. stands tall with its sterling reputation of meeting or exceeding customer demands. PMI has been in business for greater than 50 years. It is primed and ready to meet the world's switching power supply needs for the next 50 years. Contact our highly skilled application engineers today for all your switching power supply requirements by calling - 800-234-0862 today! You will not be disappointed.